When it comes to creating the perfect smoothie — healthy, delicious and packed with nutrients — superfood powders are definitely a boon. They help ensure you get all the vitamins and nutrients you need to stay healthy, officially taking your smoothie game to the next level. That said, the sheer amount of options can get overwhelming — there are just so many to choose from. How do you know which ones are the best? Well to start, naturopath and holistic health expert Dr. Nancy Steely, ND, MBA suggests including a rainbow of fruits and vegetables, to ensure you get the full spectrum of vitamins, etc. "Reds, greens, yellows, blues — these colors are all indicative of different phytonutrients in foods, and each offers their own health benefits," she says. "[Look] for a finished superfood powder product with a range of colors because they can take the nutrient content of your smoothie to the next level, providing support for a variety of body systems." 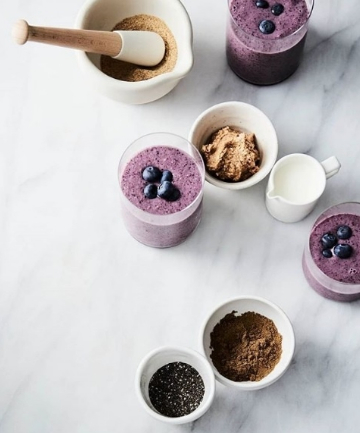 Though she advocates for mixing different superfood powders, Steely cautions users to be mindful about amounts, since too much can impact texture and taste... and at the end of the day, we want a smoothie that we don't have to down with a plugged nose. Keep reading to see some of our favorite superfood powders — that are nutritious and tasty.